THE GUIDE WHO GUIDED GENERATIONS OF DIRTBAG RUBBER PUSHERS ~ DBPINTERVIEWS WILLIAM McGINNIS, Author of "THE GUIDE'S GUIDE. | DBP MAGAZINE ONLINE The World's Best Free Whitewater Publication. THE GUIDE WHO GUIDED GENERATIONS OF DIRTBAG RUBBER PUSHERS ~ DBPINTERVIEWS WILLIAM McGINNIS, Author of “THE GUIDE’S GUIDE. Folks who aspire to greatness, no matter the forum, all look to those who came before them for inspiration, for lessons learned and pitfalls to avoid, for reassurance, for guidance. Oftentimes, however, we come to find our heroes are less than heroic, and have no time for us. What makes our particular community so special is the fact that our elders don’t conform to that unfortunate cynical reality. Those who preceded us on The River thankfully tend to be genuine, caring people who are willing to take an interest in our progression and well being. They give freely to us what it is we need to succeed, with open heart and open arms. They pay it forward. So it is with one of my personal heroes, William McGinnis. Long ago, the Dirtbag bug bit me, and I took to rafting. I wanted to be a great river guide, and I wanted to do all of it right. But where to begin? I can’t recall how it fell into my hands, but thankfully some enlightened friend entrusted me with a copy of the book “THE GUIDE’S GUIDE”, and I was off. Sure, I wanted to know what to say to my guests, how to handle my boat with competence, what hand signals to use, what to do in emergencies. But what truly made my heart soar was the deeper meaning that Mr. McGinnis instilled into the sport, the art of guiding. This foundation, once laid, proved to be unshakable, and informed all of my following exploits in whitewater, first in professional guiding and private boating, then in being a river manager, and now in my new found role as a voice for the community in my own right. Which led me to ask this hero of mine to do an interview for DBP MAGAZINE ONLINE. You never know what you’ll get till you ask… What I was blessed to receive was a heartfelt reply. The stoke was as big on his end as it was on mine! The thrill of talking with the man who inspired you, and put you on the right path, and who is now conversing with you on a first name basis, well that’s just about as cool as it gets! What follows is the result of living your dreams and pursuing the right path. I won’t keep you further, other than to say, “thanks for everything!” I’ll pay it forward. 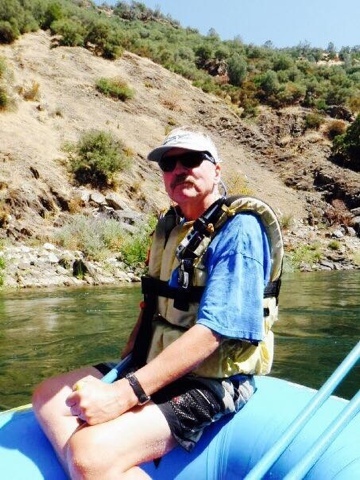 DBP: You started your river career training to be a guide in 1963, starting your own company, Whitewater Voyages, in 1975 with two rafts and $500. Tell us a bit about the old days on The River. How has commercial rafting changed since the golden years? What has changed the most for the individual river guides? McGinnis: In the old days it was normal to see no one on the river. I remember a three-day weekend in the early 60s on the South Fork American in California where we saw no other rafts. The gear was war surplus and more suited to surviving a plane crash in the ocean then to the river running. Little was known about river boating, rescue techniques, or people skills—we winged it and “invented the wheel” again and again. Another big difference was that back then guides took full responsibility for repairing their equipment–if their boat got damaged they were the ones to patch it themselves–sometimes staying up half the night to get their boat ready for the next day. Today of course most rivers have lots of people–the sport has come a long way in popularity and evolution. Now we have specially designed boats, frames, toss bags, rescue gear, dry suits! And a lot more shared wisdom. And, of course, today few river guides repair their own boats. DBP: Your book THE GUIDE’S GUIDE is THE authoritative book on how to be a professional river guide. When you first began to assemble the notes of your training for rookies coming into your company, did you think this would be the case? McGinnis: I’ve always been a writer first and an outfitter second. Writers want to be read. The Guide’s Guide started off as a handful of notes that I used to train new guides, and gradually grew and grew until I pulled it together into the first Guide’s Guide–and that continued to grow and grow until I pulled it all into the Guide’s Guide Augmented. I tried to be thorough and make it useful for my guides–but I also at the same time tried to make it useful for all guides. I had no idea what the future held, but I was aware of how unique this collection of information was. I realized there was nothing else like it. And I am very glad that it’s now used by guides all over the world. DBP: Your safety talks and the modular outlines provided for contingencies are the basis that most raft outfitters today use for their trips. What was it like in the formative days before this blueprint existed? Did you think your ideas about how a talk should be conducted would become universal? McGinnis: I’m humbled and honored that the safety talks are used so widely. Interestingly enough, I felt and still feel the safety talk section of the Guide’s Guide Augmented could use more work–but at a certain point I just had to pull it together, polish it a bit, jam it in the book and call it done. I’m very pleased folks appreciate it and use it. DBP: You have been an inspiration in regards to your feelings about how to treat rafting customers, emphasizing kindness and positivity. These things, and many others you write about, seem second nature yet can easily be forgotten in the heat of a long summer pushing rubber. What caused you to add these important aspects of good guiding, which would be so easy to overlook? McGinnis: Of course, getting people safely down the river is vital, but that’s just the beginning. A good river trip is so much more than just a physical journey from put-in to take-out. Ideally it is also a journey from fear to confidence to joy; from being a stranger in a group to feeling accepted, at one with, bonded with one’s boat mates; from feeling a bit scattered and self critical within oneself to feeling self accepting, present, and whole; and, ideally, from feeling perhaps cut off from nature to being appreciative, aware, and at one with nature and this magnificent planet. At the heart of creating this experience is kindness, appreciation, noticing and being present with and accepting people–oneself and others. The ”people skills” in the Guide’s Guide are all about creating this kind of multi-level, rich, inner and outer journey. DBP: Your theories on Deep Fun have had a huge impact on how river guides approach their time with customers. At its core, Deep Fun is a philosophical approach to moving those one time customers, which the majority of rafters are, from fear to courage and ultimately to joy. What brought you to this fundamental understanding in your personal experience? McGinnis: The concept of Deep Fun welled up and grabbed me. Basically, I find that I and others open up, expand, grow, experience joy, and just plain feel more alive in an atmosphere of kindness, support, and acceptance. This, in essence, is simply enlightened self-interest. By creating an atmosphere of acceptance and appreciation for others, I was creating it for myself. What could be better? I somehow stumbled upon this philosophy or rather the river and the universe offered it up and I never let it go. DBP: Another very serious topic tackled in your writing is dealing with emergencies and tragedy on The River. We all think of the lighthearted fun and good times to be had when we start out as raft guides, but stay in the business long enough and one will eventually be confronted with serious decisions. Was there anything in writing for you when you first started out as a raft guide, and did this influence your writing on these subjects? McGinnis: In the early days of river running, little was known–or written–about handling emergencies. The fact is, of course, there is inherent risk in river running and so I have always placed a lot of attention on preparing for and hopefully minimizing dangers. The entire Guide’s Guide is part of this preparation. The safer everyone’s trips are–and the more effective all of our river and rescue skills are, the safer and happier and more successful all guides, outfitters and clients will be. So it’s a no-brainer to share everything I can. I’m very gratified that my contribution has helped and been well received. DBP: When composing your book, you seem to have thought of EVERYTHING: details of meal preparation, taking care of the equipment, even the trees on your property (“don’t back into the graceful darlings” – I love this quote by the way). Was it difficult to work for Bill McGinnis, or does this type of training make it easier? McGinnis: On the subject of whether or not I was a good employer to work for–you should ask the people who have worked for me. On the one hand we are amazing beings with infinite potential on this magically beautiful planet, and, on the other hand, at the very same time, we find ourselves in a world filled with sadness, pain, and fear. Any newscast confirms the latter, and most river trips with caring companions confirm the former. Part of the dilemma is that this pain, suffering, and fear can feel so pervasive that they can seem to render the infinite potential and magical beauty empty and hollow. Unfortunately, I don’t have a solution for this Really Big Picture. But I do have a suggestion: Treat others and yourself with kindness, acceptance and appreciation. When we create an atmosphere of support and acceptance, we all can let our hair down, ease out of our fears, stop defending ourselves, open up, blossom, relax, be ourselves, grow, and expand. A wonderful gift is that in the process we become more connected to ourselves, others, and our planet, and we truly become more present, energized, alive, and whole! Third: …and then turn them loose. You might notice that the ideas in the Guide’s Guide are expressed as guidelines and ideals–and rarely as rigid rules. DBP: You also cover the basic fundamentals of river signals and knots, two key skills for the boat person to master. Where did you learn your knots? And did your book help to codify the hand signals, or was that fairly uniform when you were coming up through the ranks? McGinnis: Initially I learned most of my knots from knot books, such as the Ashley Book of Knots. Later I learned more knots in swift water training classes and from students in my guide schools. Every now and then a student would show up knowing every knot imaginable. The key thing for me in learning knots is to focus on learning just one or two at a time—and practice them enough to build them into my repertoire. It was when I tried to learn too many at once that they would escape me a month later. The Guide’s Guide Augmented includes every useful signal that I could either find or think up. Many were in use on rivers or elsewhere, and many I adapted from signing, the language of the deaf. DBP: Some fun questions: it’s a beautiful day in California, the PERFECT DAY, sunny skies, lots of water… What stretch of river are you running? What is your favorite boat to run, and why? McGinnis: My favorite river is the river I’m on at the moment. Yes, it’s very thrilling to run the Forks of the Kern and other high-level challenges. But I’ve probably had more amazing experiences on class III and IV rivers like the South Fork American, the Kings, and the Lower Kern. I remember doing a one-hour lickety run on the Upper Kern with a family that enjoyed it so intensely, we were all truly transported into an altered state of consciousness—a euphoria of amazing joy and appreciation for one another and for life itself! Rowing vs paddling: For 11 years my favorite boat was an oar boat– an 11-foot yellow, Air Force survival raft for which I had made a wooden rowing frame with 9-foot oars. I loved being at those oars and running rivers all over the West in that boat. Later I switched to paddle captaining and have been in love with that ever since –perhaps because it is such a shared experience, with all the people in the boat fully involved and coming together. For me, creating a strong crew and entering into their experience, their energy, makes the river new each day. Favorite boat: Probably a 14-foot self-bailer with 20-inch tubes would be the ideal– either plastic or rubber, Lexitron or Hypalon. There’re a lot of great boats now–especially compared to what we had to work with back in the beginning in the prehistoric days. DBP: We are all in between swims. Can you tell us about a particularly nasty swim you’ve had? What is your nemesis rapid? DBP: You are an inspiration to many of the boaters who are now the senior guides and leaders of the industry (my copy, the second one I bought after ruining my first one, is the GUIDE’S GUIDE AUGMENTED from 2005). We all cut our teeth on your way of guiding, and many of us make your book standard reading for serious rookies who show a talent and passion for our work and lifestyle. Your beliefs and style of leadership are a gift to the future. Do you think much about your legacy to the raft guides of tomorrow? Or are you too busy having fun? McGinnis: I am humbled, honored, and thrilled to have played the role I have. I’m thankful that my ideas have been warmly received, and hopefully they will make a positive difference on rivers far and wide. DBP: Thanks so much for your time, and all that you’ve done for the dirtbag community! Got any neat plans? And any last words of inspiration for the Dirtbags? McGinnis: These days I’m mainly focused on my writing. I recently released an audiobook version of my novel Whitewater: A Thriller. By the way, in addition to being a gripping, fun, edge-of-your-seat read, this novel is suffused with the very philosophy that permeates the Guide’s Guide Augmented. Also, I’m working on a new novel which follows many of the Whitewater characters in a second white-knuckle adventure. Entitled Gold Bay, this rough-and-tumble tale weaves together the Guide’s Guide philosophy, the natural wonder that is San Francisco Bay, and the rich mosaic of sub cultures that make up the Bay Area. Also, I also have some fun trips planned for the Kings, the Lower Kern, and the South Fork American which are about my speed at this time in life. Some Words of Inspiration: I encourage your readers to set their sights high: River running both commercially and privately is a noble quest of planet saving stature. We are not only endeavoring to get people safely down rivers. We are also helping them ascend to higher levels of wellness, awareness and aliveness. Like ripples fanning out from a boat pushing across a smooth calm, we create and send forth life enhancing energy waves of adventure, friendship, and growth. Got to be good for the planet! You are both a poem and a river. You and the people you share adventures with are rich, multifaceted, ever-evolving souls, beautiful living, breathing poems. The concept of “You are a River” can be understood by considering the old adage: If you can say how you feel to at least one other person, it can free you to feel something new. The idea here is to create friendships in which (at appropriate times in appropriate ways –usually not in the middle of emergencies, etc..) you can be open and real and say what is true for you. When you express your truth, your feelings move and flow on through, and then lo and behold new feelings come—and on and on, your river of aliveness flows and gains strength. This process of expression, of inner movement, is what being fully alive is all about. Consider for a moment the opposite, that is, not expressing one’s feelings. This amounts to being dammed up inside. Blocked. This leads to emotional and physical discomfort, disease and even death. So keep that flow moving. Your inner river is the wellspring of your health, your spirit. If you preorder Disaster on the Clearwater: http://www.williammcginnis.com/disaster-on-the-clearwater-2/#sthash.yefIrv0N.dpuf now and email Bill confirmation of your preorder (send to: [email protected]), he will send you a glorious, free, autographed whitewater color poster! Tell him you read about it in DBP MAGAZINE ONLINE!